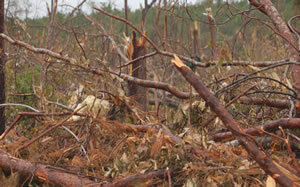 Tornadoes snapped trees in Alabama's forests. This month marks the second anniversary of the deadly tornadoes that tore through Alabama, flattening portions of Tuscaloosa, Birmingham, and other cities and battering rural areas of the state. The twisters in April 2011 killed many people, destroyed homes and businesses, and toppled trees. 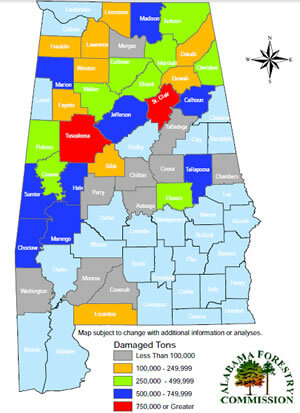 Damage to forests occurred in 39 Alabama counties. 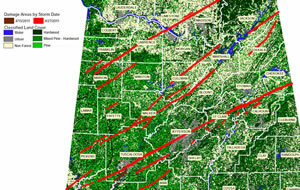 To assess and map this devastation, the Alabama Forestry Commission (AFC) used ArcGIS from Esri. "The ability to use GIS technologies to integrate cadastral, remotely sensed, and observational data greatly reduced the time frame necessary for developing the assessment information," said Patrick A. Glass, assistant state forester, AFC. "Geoprocessing models developed in response to the tornadoes allowed for unprecedented speed and precision in producing results that are portable and scalable to any significant geographic area." To assess forest types impacted by two tornadoes, a model used tornado path polygons derived from aerial reconnaissance, the National Land Cover Database (NLCD), and parcel data. Data from Esri, AFC, the National Oceanic and Atmospheric Administration National Weather Service (NOAA/NWS), and the US Geological Survey (USGS) was also used. The AFC collected GPS Exchange Format (GPX) files on the tornado paths and converted them to feature classes for GIS analysis to meet agency objectives. AFC GIS specialist Abi Dhakal created the maps for analyzing and assessing the total forest damage by acre, by county, and for the entire state. Dhakal created a GIS model that significantly reduced the time required to produce these geospatial products. Manually geoprocessing data for 39 counties individually and generating maps for tornado damage analysis would have taken weeks, if not months, to complete. Instead, Dhakal used ArcGIS ModelBuilder to build a batch processing workflow that let him quickly and efficiently processes multiple datasets. He could easily access ArcGIS tools—including Select, Intersect, Buffer, Clip, and Tabulate Area—in the geoprocessing models. Dhakal designed more than a dozen geoprocesses and steps to produce results. By slightly tweaking the models, he could make subtle changes to meet analysis objectives. It took him a few days to develop the GIS model, but after he finished it, the model ran data for multiple counties through geoprocesses and created damage analysis maps in just a few minutes. 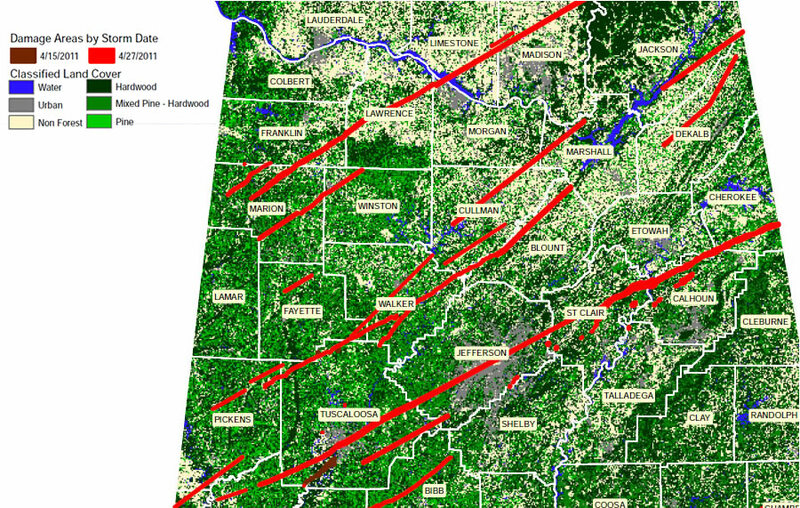 The volume of timber damage was calculated for each of the 39 Alabama counties impacted by the tornadoes. The data is from AFC, Esri, National Land Cover Database (NLCD), and USGS. Next, Dhakal and Glass calculated the volume of timber loss based on the US Forest Service Forest Inventory and Analysis (FIA) Program data for the area. FIA is the nation's forest census database that includes forest area and location; the species, size, and health of trees; total tree growth, mortality, and removals by harvest; wood production and utilization rates by various products; and forest land ownership. Finally, they applied Timber-Mart South standing timber prices to the volume loss and calculated tornado damage to the forests in US dollar amounts. Alabama's congressional delegation used the results of the analysis as documentation in a request for supplemental funding from the US Department of Agriculture (USDA) Farm Service Agency's Emergency Forest Restoration Program. Results were also used by AFC, the Alabama Forestry Recovery Task Force, the Alabama Cooperative Extension Service, and other agencies, to manage the forest's recovery. The AFC estimated that 26,733 acres of forest were impacted by the tornadoes on April 15, 2011, with an assessed value of $37,728,175. The April 27 tornadoes were estimated to have damaged 177,857 acres, with an assessed value of $228,360,576. Impact to the forestland in Alabama from the April storms totaled 204,590 acres, with an assessed value of $266,088,751. Contact Dhakal to learn more about the forest damage assessment model.